SAN DIEGO -- The U.S. Navy’s biggest, most expensive and most technologically advanced destroyer arrived at its homeport on Thursday after a nearly four-month transit that included some hiccups, such as a high-profile breakdown in the Panama Canal. The USS Zumwalt arrived in San Diego to a welcoming ceremony that included the commander of naval surface forces, Vice Adm. Tom Rowden. The ship has a crew of 147 officers and sailors, and its commanding officer is Capt. James Kirk. “We have looked forward to pulling into San Diego for a long time,” Kirk said. The Zumwalt departed Maine shipbuilder Bath Iron Works in September before being commissioned into service in Baltimore in October. It made several additional port calls en route to its final destination. During the trip, the first-in-class ship was sidelined for repairs a couple of times, including after it lost propulsion in the Panama Canal, necessitating a tow and an extended stay for repairs. In San Diego, the crew and contractors will begin installation of combat systems and further testing and evaluation. 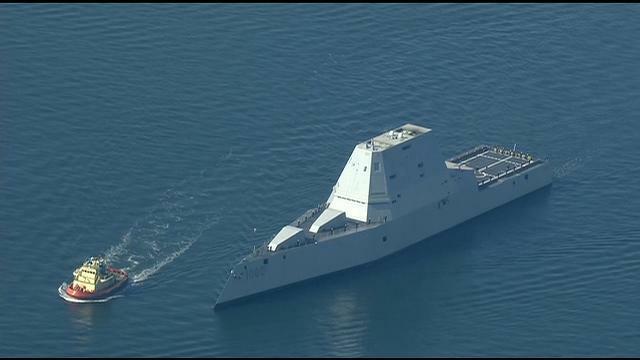 The Zumwalt is a battleship for the 21st century, designed to strike targets in a country like North Korea, according to Ron O’Rourke of the Congressional Research Service, CBS News’ David Martin reported from the ship in October. “With their guns, they could reach in from either side of the peninsula, pretty far in, to cover a large portion of the territory of the peninsula,” O’Rourke said. But the new technologies kept driving the cost up, and the number of ships the Navy could afford down from 32 to just three. That explains why the Zumwalt alone cost an astronomical $4 billion. It’s now up to the ship’s crew to make the Navy’s newest destroyer pay off.